You know I just had to write something today or else I’d have to wait 4 years. Happy Birthday to me….. I made this chocolate birthday cake because no one else wanted to buy a cake for me. I know how because BITC taught me how. Valrhona chocolate on the inside, Ghirardelli chocolate on the outside. I think it looks quite okay, if I say so myself. It could have been better but I didn’t have a turntable and I had to use the plastic plate as a makeshift base instead of a proper one. I made this at home last night, iced it this morning, and brought it to Il Lido restaurant for my birthday lunch. I wanted to pipe rosettes but there wasn’t enough time. Il Lido kindly provided a little candle plus the white plate. I celebrated my birthday with my parents and The Partner at Il Lido today. 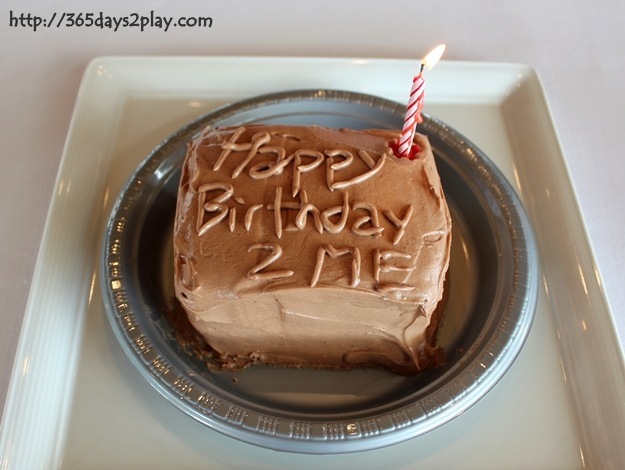 Yesterday, I had a pre-birthday celebration with The Partner at The Prime Society in Dempsey. I had the most fantastic piece of meat I have eaten in a very long time, perhaps ever to date. It was SO DELICIOUS it was almost unbelievable. It was a Wagyu Tri-Tip. More about that in a separate post. AND, The Partner is taking me to the Tott Store to pick out a kitchen gadget as my birthday gift. Can’t wait! If you have been following my blog, by now you should have known about the newest mall in Singapore, the Greenwich V. It is a small little mall, only 2 storeys high, located in the Seletar / Jalan Kayu area. About half of the establishments are eateries while the other half comprises the “daily living” type of stores such as Laundromat, supermarket, video rental and even an English language school. BTW, Greenwich is pronounced as GREN – NICH, same as the Greenwich of Greenwich Mean Time. When I first learnt of the existence of Greenwich V, and this was before any official media invite, my immediate reaction was “What a quaint little mall”! I want to get a condo apartment right above Greenwich V!!!! I was so attracted to it that the next day, which was Chinese New Year DAY ONE(!! ), I took my parents to Greenwich V for a cup of tea and cakes at Toastbox! I even grabbed a brochure on the condo, but sanity prevailed eventually as Greenwich V is just way too far from my parents place in the Eastern part of Singapore. Surprise surprise, a few weeks later Greenwich V “came to me” via an OMY blogger’s invite to check out Greenwich V via an Amazing Race style competition. 15 bloggers were selected for the competition, and divided into 3 groups. I was part of the Urban Team, along with bloggers Jesslyn, Grace, Melvin and Hazel, with Janet from OMY to ensure that we did not cheat (as if we would ever…). The Urban Team : Grace, Hazel, Jesslyn, Myself and Melvin! Our task was to guess the answers to 10 questions, which would then lead us to 10 respective Greenwich V outlets. We would then have to complete the challenge by either Eating, Learning or Doing. It really was a great way to learn more about the mall even if we had to rush rush and rush! For my reviews on Mai Thai Restaurant, Paradise Inn and ToastBox, click on the respective links. You can also read more about the other outlets, which my team members have written about here. Or you can check out Greenwich V’s Facebook and Website. Check out our crazy Amazing Race day video on Youtube! 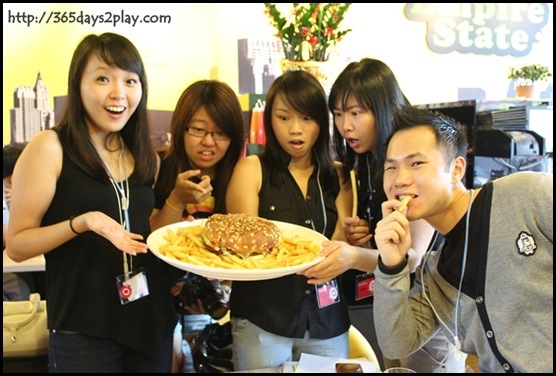 Alas, we didn’t manage to win the Amazing Bloggers Race competition. I thought the photos we submitted were of top quality (click on Urban Team!). Oh well, next time then. To my fellow Urban team members, we did our best and we have no regrets!!! * Thanks Far East Organization / Greenwich V and OMY for the wonderful afternoon and great hospitality! If there’s one chocolate drink out there that I will never tire of, it’s Milo. There’s just no other chocolate drink quite like it if you ask me. And it’s not so much about how chocolaty it is, it’s about that special flavour. When I was studying in the US, I discovered that the Americans don’t know about Milo. Imagine that. I even had to have Milo shipped over to me, that’s how much I missed it. Nowadays, I usually go for the Milo Australian Recipe one. 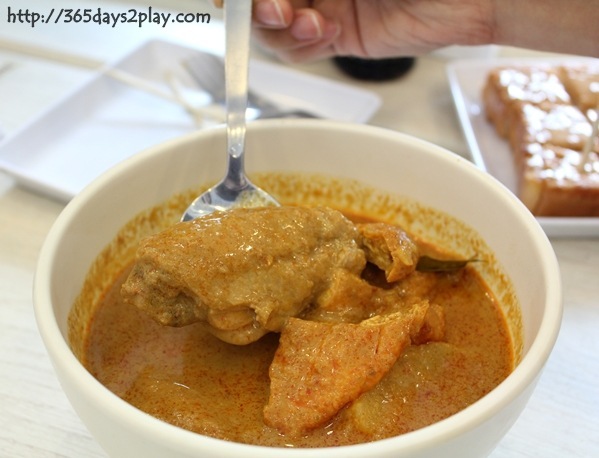 It seems richer, and when you compare the ingredient list of the Australian recipe versus the Singapore recipe, the Australian recipe uses full cream milk and does not have palm oil additives. It appears the Singapore recipe was tweaked in 2006. No wonder I don’t have to add sugar to the Milo now. But hands down, the best tasting Milo I have ever had is the Milo from the Milo truck. I don’t know what on earth they put in that Milo, but it just tastes SO DAMN GOOD! And the worst part is, you can’t purchase that Milo so it’s absolutely down to luck whether you happen to attend an event which has a Milo truck. I believe the last time I encountered the Milo truck was way back in 2004 (!) during the Army Open House! The canned Milo you get from the supermarkets comes pretty close, but not quite. The 3 – in – 1 Milo doesn’t come close at all. 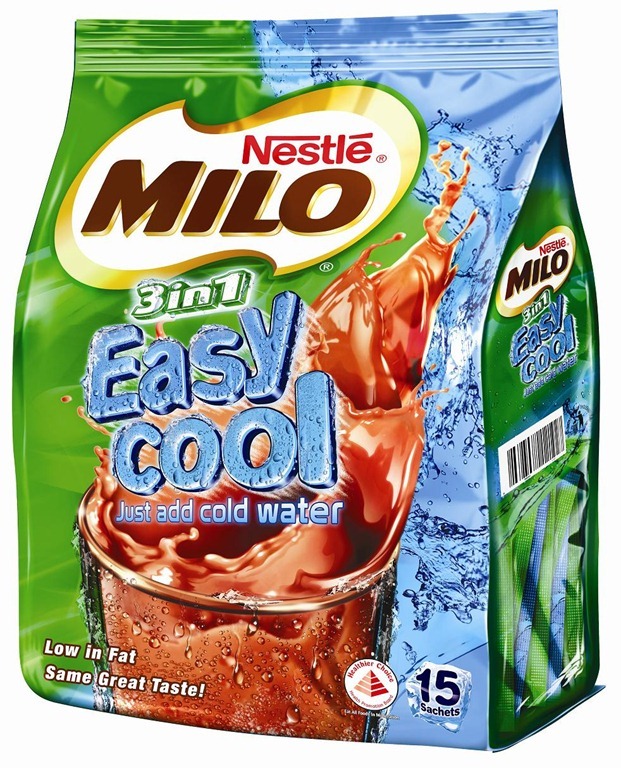 Recently, I discovered yet another Milo product in the market called the MILO® Easy Cool. This Milo is like the 3 – in – 1 Milo, but the amazing thing about it is that you don’t need hot water to dissolve the contents. You can just use tap water or cold water! There’s no need to find some hot water to dissolve your Milo, then cool down the drink with cold water. Just stir stir stir and the Milo dissolves like magic! It is really so super convenient because at my Baking School, the idiotic water cooler doesn’t dispense hot water. It only dispenses cold water. (Imagine my disappointment when I brought my own soya bean sachet to school, only to find globules of congealed soya bean powder in my cup of cold water.) No such problem with the MILO® Easy Cool. I poured the MILO® Easy Cool into my mug and dumped in a few ice cubes. Within seconds, I had a refreshing mug of ice cold Milo! If like me, you find yourself unable to get access to hot water, for example when you are outside or after a run in the park, you can still be able to enjoy a Milo drink. Apart from the convenience, the MILO® Easy Cool tastes quite like the Milo Truck Milo. Not 100%, but very very close. Really happy to have discovered this new Milo product, which in my opinion should have been out in the market long ago! So for those of you who swear by the Milo Truck Milo, go get yourselves the MILO® Easy Cool and try it out. Let me know if you think it tastes like the Milo Truck Milo! 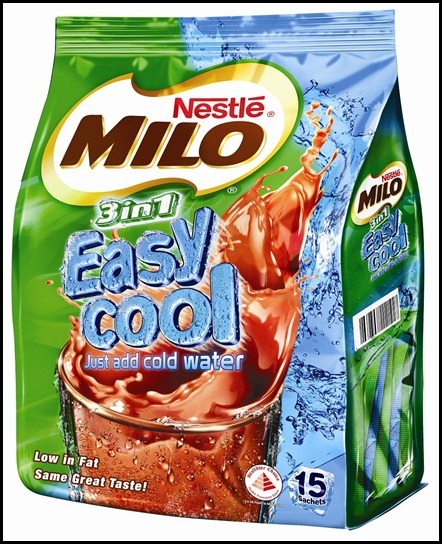 MILO® Easy Cool is available at all leading supermarkets and hypermarkets such as FairPrice, Cold Storage, Shop N Save, Giant, Carrefour and Sheng Siong. It is retailed at S$6.30 per pack of 15 sachets. If you buy MILO® Easy Cool in February, you will also be able to get the MILO® Easy Cool shaker bottle! Quick, before it runs out! 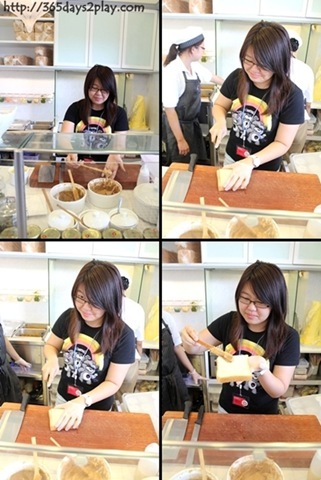 ToastBox was another outlet us bloggers visited as part of the Greenwich V / OMY.SG Amazing Blogger Race competition. It’s no secret that I like patronising ToastBox. 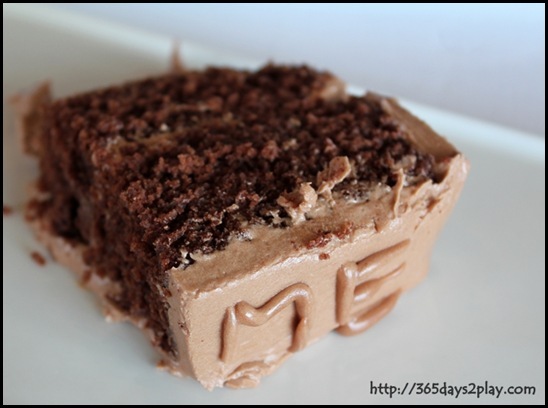 I’ve blogged about ToastBox on three separate occasions, read it here, here and here. I really like the Victorian, old school decor. The teh is pretty good and the tea cakes are so cute and affordable! ToastBox at Greenwich V flanks the main entrance. You won’t miss it at all when walking or driving in. 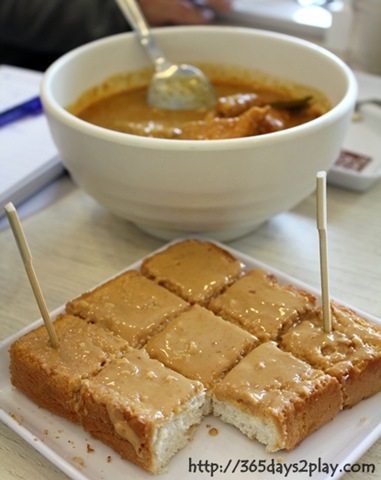 For our Bloggers Amazing Race challenge, we got to sample the Peanut Thick Toast as well as Chicken and Potato curry. 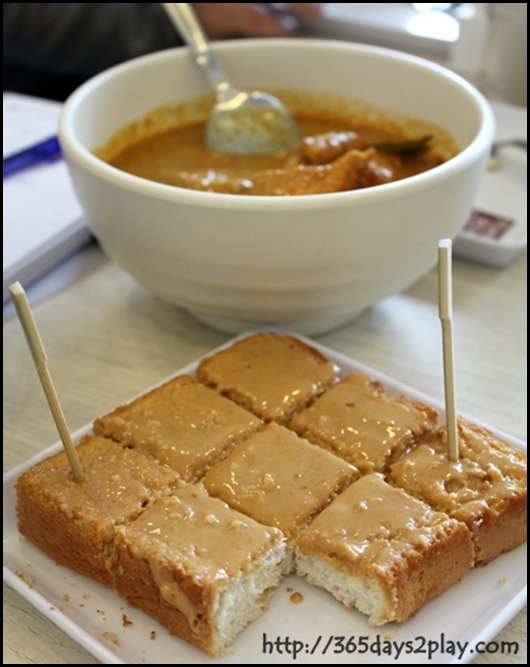 ToastBox serves hot meals so it’s not just a place for a snack, it’s also an option for breakfast, lunch and dinner. They are pretty generous with the Peanut butter. But this is my ultimate favourite at ToastBox. 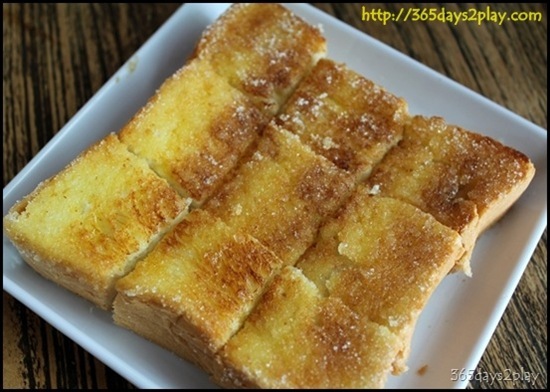 The Butter Sugar Thick Toast. Generous amounts of butter slathered onto hot fluffy toast, with sprinklings of sugar. It is SO GOOD. Trust me, not many places spread the butter so evenly for you. This is the best place to have butter sugar toast. Hazel of Ai Makan having a good time preparing our meal. Read more of my reviews of Greenwich V outlets here. Or read what other bloggers have to say about Greenwich V.